that's how old my third noisemaker is today. you are STILL always happy. (we don't get, it but we love it). you may be small for your age but you are the loudest kid we own. every night at 11:07 (give or take a few minutes) you wander around the house till dad or i direct you to the bathroom. YOU LOVE CEREAL. doesn't matter what kind, you want it, and you'll take it at any moment. you just recently have taken a liking to your little sister. you ROCK at reading and counting. you're brothers are your best friends. you're favorite video game is "little big planet"
you are really good on the skate board. no matter how many times we put you back in your bed at night, the first thing dad sees in the morning is you, in our bed. no one in the family can clean the your bedroom as good as you do. it's a talent i tell you. it makes me proud. little dude you are so awesome. and we love having you in our family. you make life fun and make people happy because you are so happy. i hope your day is great. Happy Birthday to your awesome son! Boys are great and i love it to have both, boy and girl! Greets from far away ;) from windy an d cloudy germany ! Happy birthday, he looks great! Yay, happy birthday little man! Such a wonderful smile. I love "noisey boys" - makes life fun. Aw, how sweet! Happy birthday! How sweet. Can he teach my girls to clean? Happy Birthday! Happy 6th birthday to him. I hope he always stays so happy. What a handsome boy! Happy Birthday little dude. What a cutie! I WISH my son would let me do his hair like that. Love it! Happy Birthday little dude! Happy Birthday #3 Noisemaker!!! You're Adorable!!! Aw, what a handsome little guy! Happy Birthday to your son!! He is adorable! We're glad you were born our friend! May you continue to grow in light and love and strength and spirit and joy. Happy Birthday!!! May you have many many more, and twice as many bowls of cereal!! i want one of those... where can i get one?? Happy Birthday Kyle!! 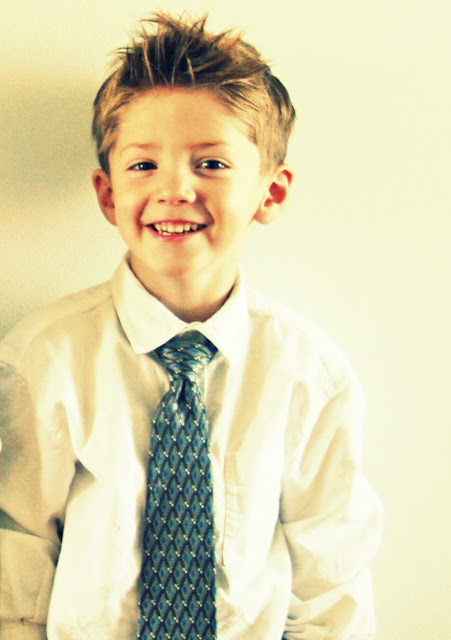 Holy Crap, I cant believe he is 6. Soooo cute. Wow time flies!!! He is so cute! And that is one, big, GENUINE smile on his face. Happy Birthday! I can't believe he's six! Summer follows in a few weeks! I remember when he was born! What a cutie! Oh, my goodness, V - another heartbreaker! You are going to have to invest in some sort of young-girl repellant to keep the giggling misses off the front porch! I just found your blog, and think I'm an instant new fan! Ok, so is it something about being #3 in a family? My #3 noisemaker is the LOUDEST person in my house, is also happy, great at school, can clean his bedroom faster than anyone, and also wanders the house at the same time of night until one of us locates the bathroom for him. Ha! Mine is 9, though. Your little guy is adorable! Too handsome. Love the shirt, tie and hair-do. He looks like a very happy young guy. Happy birthday to you young man. Hey Vanessa, I hope you don't mind if I leave a link on sewwhattoday.blogspot.com to your Life baby blanket that you posted on the Moda Bake Shop, and also the flower balls you posted on Sew Mama Sew! I'll leave these links on March 8, and March 15! will you help me help my friend?